More organelles were filtered from the leaves than the roots, sediment, or water. in progress: do we see more chimeras with PNA use? In addition to sequencing samples to see which bacteria types are present, we are also interested in imaging bacterial populations to gain understanding of how different microbe communities are spatially distributed. For example, one set of bacteria may live on the root tip, while another set may prefer to colonize the rhizome surface. Leaf-associated microbe groups tend to be different from root-associated microbes, although overlap has been reported in other plant species. Additionally, one type of microbe may be dependent on compounds released from another type, in which case you might expect to see distinct types of microbes that are clumped closely together. Alternately, competitive or antagonistic microbe groups would probably be located far apart from each other. The spatial scale of “close” or “far” and “clumpiness” is more easily identified with imaging. At the very least, imaging distinct microbe populations is a first step in identifying dependencies and preferences of microbe types within microbiome communities. The imaging method I used is called “catalyzed reporter deposition fluorescent in situ hybridization,” also known as CARD-FISH. The main idea is that you attach a fluorophore to a nucleic acid sequence of your choosing. The sequence should be unique to your microbe population of interest. 1. probe design: make an oligonucleotide (aka “probe”) that will bind your microbe’s sequence, and make sure the oligo has HRP conjugation on one end, because that is what enables CARD. 2. hybridize: fix and permeabilize your sample so your probe can get into the microbes and access their nucleic acids. 3. amplification: incubate your hybridized samples with a flurophore that recognizes your probe’s HRP binding site. There are a lot of parameters to deal with, but in theory the number of distinct microbe populations that can be imaged with CARD-FISH is limited to the number of different fluorophores and number of unique genes at your disposal. In practice, the number of distinct microbe populations you can image is more likely to be limited by the tolerance of your sample to the CARD-FISH protocol, which varies based on your microbial targets and can take days if you’re trying more than one probe. Anyway, in my case, as a first pass, I just tried one probe, eub338, which targets the 16S rRNA gene that all eubacteria should have. Probe details linked here. I used DAPI as a control stain, to verify that my probe and fluorophore were truly binding nucleic acids and not getting stuck on other things. 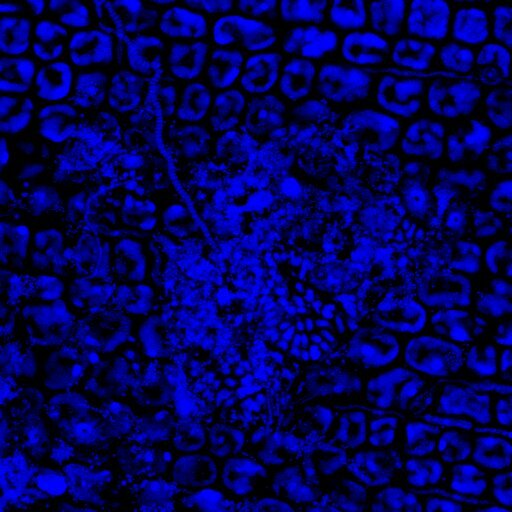 DAPI reliably binds nucelic acids, so I would expect any valid CARD-FISH signal to colocalize with DAPI. It’s not the most rigorous control stain, but it’s a start. 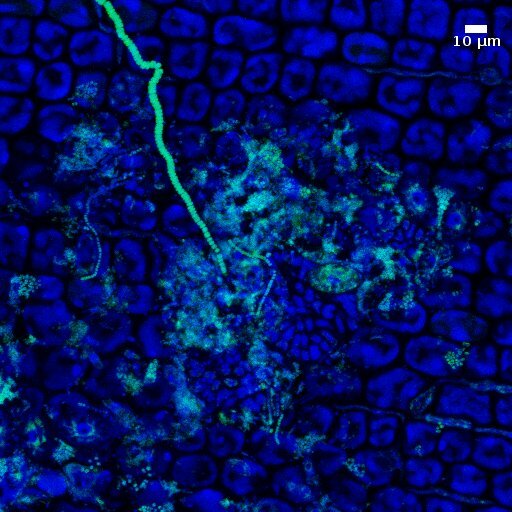 First, here is just the DAPI image of a seagrass leaf. The large square-ish cells are plant cells. Here is the same DAPI image with the eub338 signal overlaid in green. As you can see, not all DAPI signal colocalizes with eub338, which is fine- those are probably nucleic acids that did not contain a bacterial 16S rRNA sequence. They could be archaea, fungi, eubacteria that my probe could not get into, or something else. Happily, the eub338 signal that does colocalize with DAPI is our bacterial signal. This means the CARD-FISH protocol accessed at least some of the eubacteria, and means that next we can follow up with more targeted probes for subpopulations of eubacteria that looked interesting based on the sequencing results.